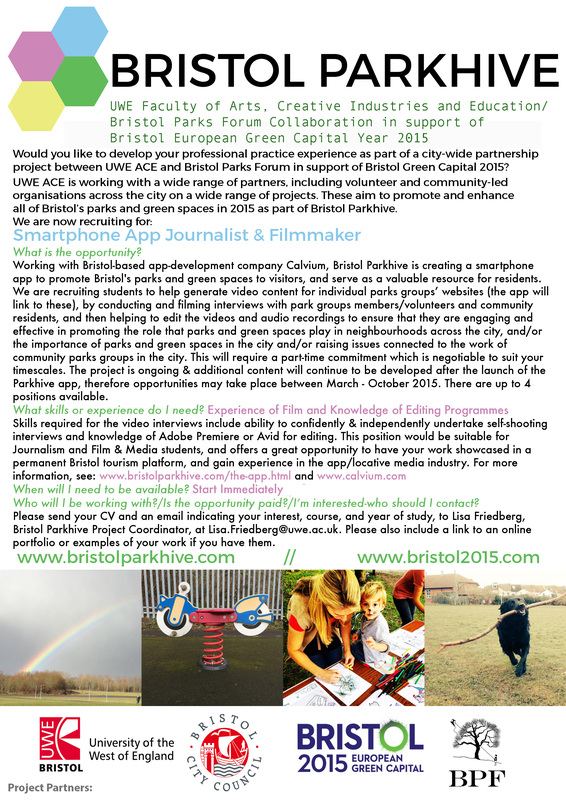 Working with Bristol-based app development company, Calvium, Bristol Parkhive (a partnership project between UWE ACE & Bristol Parks Forum in support of Bristol European Green Capital 2015) is creating a smartphone app to promote Bristol's parks and green spaces to visitors and serve as a valuable resource for residents. The app will connect visitors and Bristol residents to information about parks facilities, walking routes and trails, parks groups activities and events, travel info, and local stories and histories - turning all of this content into a user-friendly, visually appealing cross-platform app which will be launched at Bristol Festival of Nature’s harbourside event in June 2015 (this attracts approximately 15,000 visitors) & will then be promoted ongoing by Destination Bristol - the city’s visitor information service. The aim of the app is to increase both the usability and visibility of ALL of Bristol’s parks and green spaces. We are recruiting students to help generate video content for individual parks groups’ websites (the app. will link to these), by conducting and filming interviews with park groups members/volunteers and community residents, and then helping to edit the videos and audio recordings to ensure that they are engaging and effective in promoting the role that parks and green spaces play in neighbourhoods across the city, and/or the importance of parks and green spaces in the city and/or raising issues connected to the work of community parks groups in the city. This will require a part-time commitment which is negotiable to suit your timescales. The project is ongoing & additional content will continue to be developed after the launch of the Parkhive app. Therefore opportunities may take place between March - October 2015. There are up to 4 positions available. Skills & Attributes: Required for the video interviews include ability to confidently & independently undertake self-shooting interviews and knowledge of Adobe Premiere or Avid for editing. Suited for: This position would be suitable for Journalism and Film & Media students, and offers a great opportunity to have your work showcased in a permanent Bristol tourism platform, and gain experience in the app/locative media industry. 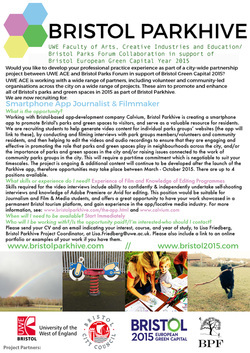 Please send an email indicating your interest, course, and year of study, and CV if appropriate to Lisa Friedberg, Bristol Parkhive Project Coordinator, at Lisa.Friedberg@uwe.ac.uk. Please also include a link to an online portfolio or examples of your written work if you have them.